Spanish giants, FC Barcelona, defeated Real Betis in LaLiga to extend their lead on the top of the table. The comfortable 4-1 victory solidified Barcelona's hold in the Spanish League as Atletico Madrid failed to keep up the pace this weekend and lost 2-0 against Athletic Bilbao. After great performances in the Copa del Rey and Champions League in the past weeks, Ernesto Valverde's men continued their good form in LaLiga. They will face Valencia in the Copa del Rey final and Manchester United in the Quarter Finals and currently, 10 points ahead of their closest rivals, Atletico Madrid, in the Spanish League. Lionel Messi completed his majestic week, just before the International break, as he netted a stunning hat-trick to lead the Blaugrana from the front. The Argentine genius was involved in four goals in the midweek Champions League fixture against Lyon, scoring twice and assisting two in a big win for the Catalan giants. The 31-year-old talisman is showing no signs of slowing down and is clearly enjoying another historic campaign. 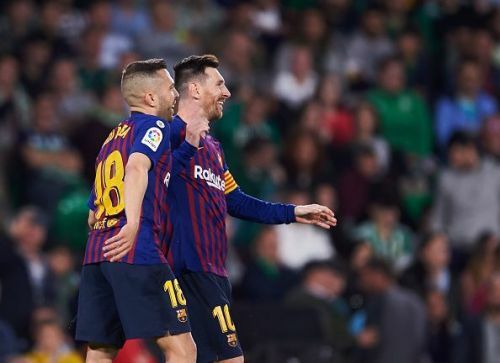 Messi opened the scoring with a sensational free-kick against Betis, before tapping in from a brilliant Luis Suarez pass and finally, added a third in the dying embers of the game. Even the rival Betis fans could not hide their admiration as they applauded the genius at the end of the match. Messi has involved in 41 goals already in LaLiga - 29 goals and 12 assists and it is safe to say that Messi is on a league of his own. The free-kick to open the scoring was inch perfect and no keeper in the world would have been able to save that. From the right side in front of the box, Messi managed to curl the ball into the left corner of the net, rendering the Betis goalkeeper helpless in thin air. What a goal. Messi. Woof. In terms of precision, that’s among Messi’s greatest free kicks. Holy crap. 👟⚽ What a strike from Leo Messi! 💥 Bang in the top corner. Beautiful. Just beautiful. Messi's freekick overrated. But he's a better ratio than CR7, Ronaldinho and Carlos.